Please contact us for pricing information for specific countries. A consultant will call you within 24 hours to discuss your conferencing needs with you. If you need to conference urgently, please freecall us on 0800 480 257. Dial and Connect is an easy way to start a conference call with your teams or clients in other locations. 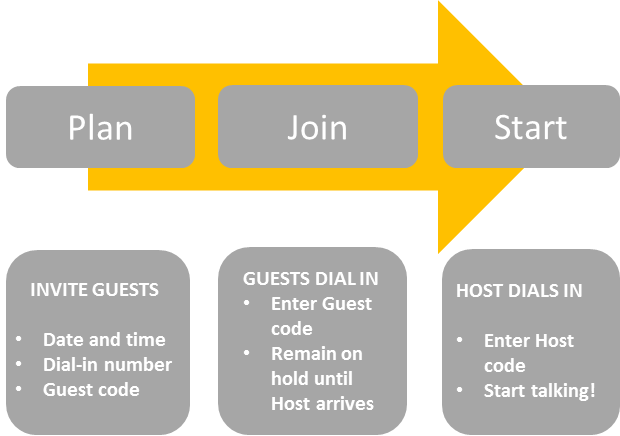 You don’t need to book your conference call, you can just choose a date and time for the conference, let everyone know the dial-in numbers and guest code and start conferencing! The communications strategy within our national business has been revolutionised by our adoption of the Express Virtual Meetings platform. Being a national business with 14 capital city and regional offices, this meant going through the expensive exercise of flying people around the country to one central location. Add to this accommodation, catering and associated costs, this was traditionally an expensive exercise. Since December 2011 we have been holding all meetings and training sessions using the Express Virtual Meetings platform in conjunction with the traditional teleconferencing facilities. I must say I am pleasantly surprised as to the great feedback we have received from our team members around Australia. Not only does it save us financially, but most importantly it saves so much time. Our team can log in from the office, from home or even on their smart phones and participate at short notice. No more wasted travel time!